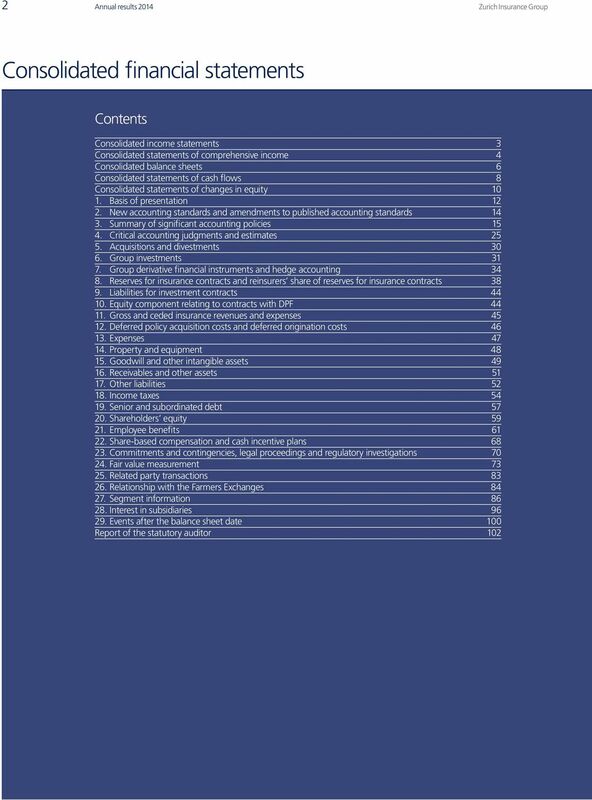 Download "Consolidated financial statements 2014. 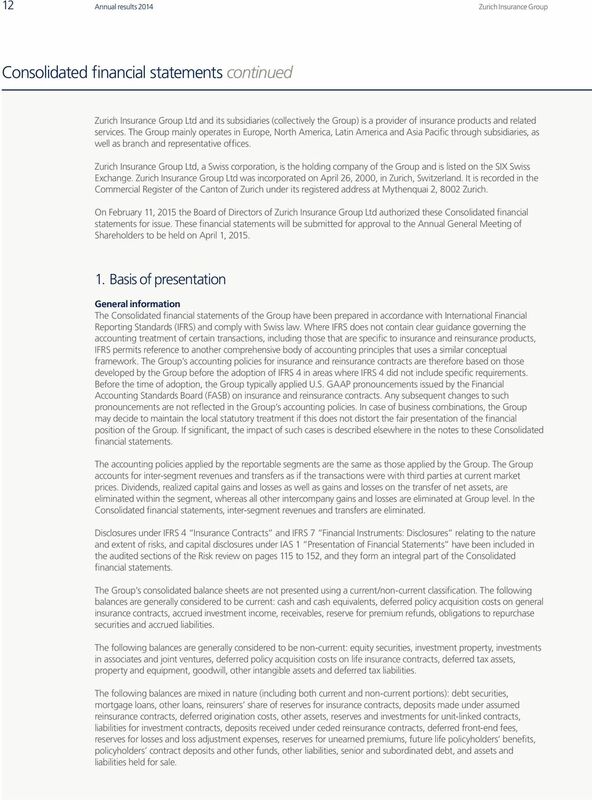 Zurich Insurance Group Annual Report 2014"
3 Annual results 2014 Consolidated financial statements 3 Consolidated income statements in USD millions, for the years ended December 31 Notes Revenues Gross written premiums 52,069 51,965 Policy fees 2,712 2,884 Gross written premiums and policy fees 54,781 54,849 Less premiums ceded to reinsurers (6,101) (6,546) Net written premiums and policy fees 48,680 48,303 Net change in reserves for unearned premiums 11 (359) (1,025) Net earned premiums and policy fees 48,321 47,277 Farmers management fees and other related revenues 26 2,791 2,810 Net investment result on Group investments 6 9,209 7,398 Net investment income on Group investments 6,206 6,240 Net capital gains/(losses) and impairments on Group investments 3,002 1,157 Net investment result on unit-linked investments 10,784 12,805 Net gain/(loss) on divestments of businesses (259) (1) Other income 1,723 1,757 Total revenues 72,569 72,045 Benefits, losses and expenses Insurance benefits and losses, gross of reinsurance 11 37,452 35,256 Less ceded insurance benefits and losses 11 (3,088) (3,058) Insurance benefits and losses, net of reinsurance 11 34,364 32,198 Policyholder dividends and participation in profits, net of reinsurance 11 12,568 13,946 Underwriting and policy acquisition costs, net of reinsurance 11 9,835 10,041 Administrative and other operating expense 13 8,910 8,804 Interest expense on debt Interest credited to policyholders and other interest Total benefits, losses and expenses 66,725 66,086 Net income before income taxes 5,844 5,960 Income tax expense 18 (1,670) (1,701) attributable to policyholders 18 (106) (285) attributable to shareholders 18 (1,564) (1,415) Net income after taxes 4,174 4,259 attributable to non-controlling interests attributable to shareholders 3,895 4,028 in USD Basic earnings per share Diluted earnings per share in CHF Basic earnings per share Diluted earnings per share Financial information The notes to the Consolidated financial statements are an integral part of these Consolidated financial statements. 4 4 Annual results 2014 Consolidated financial statements continued Consolidated statements of comprehensive income in USD millions, for the years ended December 31 Net income attributable Net unrealized gains/(losses) on available- for-sale Cash flow to shareholders investments hedges 2013 Comprehensive income for the period 4,028 (2,794) (133) Details of movements during the period Change (before reclassification, tax and foreign currency translation effects and after allocation to policyholders) (1,684) (87) Reclassification to income statement (before tax and foreign currency translation effects and after allocation to policyholders) (1,692) (86) Reclassification to retained earnings Deferred income tax (before foreign currency translation effects) Foreign currency translation effects (13) Comprehensive income for the period 3,895 2, Details of movements during the period Change (before reclassification, tax and foreign currency translation effects and after allocation to policyholders) 5, Reclassification to income statement (before tax and foreign currency translation effects and after allocation to policyholders) (1,950) 163 Deferred income tax (before foreign currency translation effects) (704) (65) Foreign currency translation effects (305) (30) The notes to the Consolidated financial statements are an integral part of these Consolidated financial statements. 6 6 Annual results 2014 Consolidated financial statements continued Consolidated balance sheets Assets in USD millions, as of December 31 Notes Investments Total Group investments 6 204, ,280 Cash and cash equivalents 7,600 7,181 Equity securities 16,099 13,183 Debt securities 153, ,456 Investment property 8,784 8,745 Mortgage loans 7,826 9,798 Other loans 10,834 11,789 Investments in associates and joint ventures Investments for unit-linked contracts 134, ,267 Total investments 339, ,547 Reinsurers share of reserves for insurance contracts 8 16,550 17,978 Deposits made under assumed reinsurance contracts 2,203 2,645 Deferred policy acquisition costs 12 17,750 18,724 Deferred origination costs Accrued investment income 1 1,912 2,321 Receivables and other assets 16 16,946 18,499 Deferred tax assets 18 1,561 2,020 Assets held for sale Property and equipment 14 1,273 1,494 Goodwill 15 1,661 1,852 Other intangible assets 15 6,754 7,028 Total assets 406, ,053 1 Accrued investment income on unit-linked investments amounted to USD 133 million and USD 230 million as of December 31, 2014 and December 31, 2013, respectively. 2 December 31, 2014 included land and buildings formerly classified as investment property amounting to USD 48 million. December 31, 2013 included assets relating to a subsidiary of Centre Group Holdings Limited amounting to USD 100 million (see note 5) and land and buildings formerly classified as investment property amounting to USD 123 million. The notes to the Consolidated financial statements are an integral part of these Consolidated financial statements. 7 Annual results 2014 Consolidated financial statements 7 Liabilities and equity in USD millions, as of December 31 Notes Liabilities Reserve for premium refunds Liabilities for investment contracts 9 70,813 67,113 Deposits received under ceded reinsurance contracts 1,022 1,245 Deferred front-end fees 5,539 5,791 Reserves for insurance contracts 8 253, ,440 Obligations to repurchase securities 1,451 1,685 Accrued liabilities 3,065 3,023 Other liabilities 17 17,230 17,904 Deferred tax liabilities 18 5,020 5,110 Liabilities held for sale 1 49 Senior debt 19 5,379 6,044 Subordinated debt 19 5,857 6,342 Total liabilities 369, ,319 Equity Share capital Additional paid-in capital 20 4,843 6,395 Net unrealized gains/(losses) on available-for-sale investments 4,068 1,730 Cash flow hedges Cumulative foreign currency translation adjustment (6,259) (4,008) Revaluation reserve Retained earnings 31,548 28,075 Shareholders equity 34,735 32,503 Non-controlling interests 2,095 2,231 Total equity 36,830 34,734 Total liabilities and equity 406, ,053 1 December 31, 2013 included liabilities relating to a subsidiary of Centre Group Holdings Limited amounting to USD 49 million (see note 5). Financial information The notes to the Consolidated financial statements are an integral part of these Consolidated financial statements. 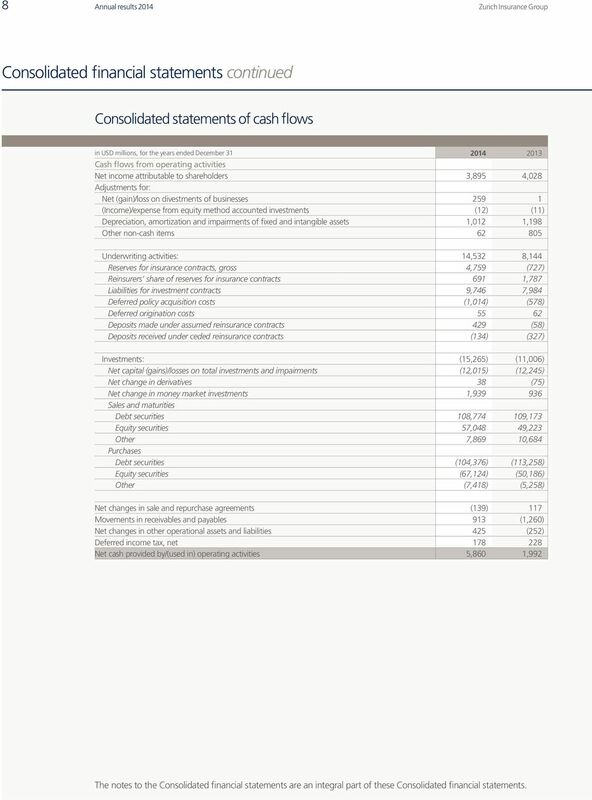 8 8 Annual results 2014 Consolidated financial statements continued Consolidated statements of cash flows in USD millions, for the years ended December Cash flows from operating activities Net income attributable to shareholders 3,895 4,028 Adjustments for: Net (gain)/loss on divestments of businesses (Income)/expense from equity method accounted investments (12) (11) Depreciation, amortization and impairments of fixed and intangible assets 1,012 1,198 Other non-cash items Underwriting activities: 14,532 8,144 Reserves for insurance contracts, gross 4,759 (727) Reinsurers share of reserves for insurance contracts 691 1,787 Liabilities for investment contracts 9,746 7,984 Deferred policy acquisition costs (1,014) (578) Deferred origination costs Deposits made under assumed reinsurance contracts 429 (58) Deposits received under ceded reinsurance contracts (134) (327) Investments: (15,265) (11,006) Net capital (gains)/losses on total investments and impairments (12,015) (12,245) Net change in derivatives 38 (75) Net change in money market investments 1, Sales and maturities Debt securities 108, ,173 Equity securities 57,048 49,223 Other 7,869 10,684 Purchases Debt securities (104,376) (113,258) Equity securities (67,124) (50,186) Other (7,418) (5,258) Net changes in sale and repurchase agreements (139) 117 Movements in receivables and payables 913 (1,260) Net changes in other operational assets and liabilities 425 (252) Deferred income tax, net Net cash provided by/(used in) operating activities 5,860 1,992 The notes to the Consolidated financial statements are an integral part of these Consolidated financial statements. 9 Annual results 2014 Consolidated financial statements 9 in USD millions, for the years ended December Cash flows from investing activities Disposals of tangible and intangible assets Additions to tangible and intangible assets (1,381) (831) (Acquisitions)/disposals of equity method accounted investments, net 95 (24) Acquisitions of companies, net of cash acquired (100) Divestments of companies, net of cash divested 67 Dividends from equity method accounted investments 1 1 Net cash provided by/(used in) investing activities (1,233) (788) Cash flows from financing activities Dividends paid (2,958) (2,889) Issuance of share capital Net movement in treasury shares Other acquisitions and divestments related cash flows (403) Issuance of debt 1,526 1,545 Repayment of debt (1,560) (1,948) Net cash provided by/(used in) financing activities (3,241) (3,233) Foreign currency translation effects on cash and cash equivalents (773) (17) Change in cash and cash equivalents 614 (2,046) Cash and cash equivalents as of January 1 8,162 10,208 Cash and cash equivalents as of December 31 8,776 8,162 of which: Group investments 7,600 7,181 Unit-linked 1, Other supplementary cash flow disclosures Other interest income received 6,261 6,437 Dividend income received 1,968 1,724 Other interest expense paid (1,124) (1,180) Income taxes paid (1,379) (1,186) Cash and cash equivalents in USD millions, as of December Cash and cash equivalents comprise the following: Cash at bank and in hand 6,592 5,746 Cash equivalents 2,184 2,416 Total 8,776 8,162 As of December 31, 2014 and 2013, cash and cash equivalents held to meet local regulatory requirements were USD 817 million and USD 1,284 million, respectively. Financial information The notes to the Consolidated financial statements are an integral part of these Consolidated financial statements. 10 10 Annual results 2014 Consolidated financial statements continued Consolidated statements of changes in equity in USD millions Additional Share capital capital Balance as of December 31, ,172 Issuance of share capital Dividends to shareholders 2 (1,933) Share-based payment transactions (4) Treasury share transactions 4 8 Change in ownership interests with no loss of control Reclassification from revaluation reserves Total comprehensive income for the period, net of tax Net income Net unrealized gains/(losses) on available-for-sale investments Cash flow hedges Cumulative foreign currency translation adjustment Revaluation reserve Net actuarial gains/(losses) on pension plans Net changes in capitalization of non-controlling interests Balance as of December 31, ,395 paid-in Balance as of December 31, ,395 Issuance of share capital Dividends to shareholders 3 (1,815) Share-based payment transactions 61 Treasury share transactions 4 2 Change in ownership interests with no loss of control Total comprehensive income for the period, net of tax Net income Net unrealized gains/(losses) on available-for-sale investments Cash flow hedges Cumulative foreign currency translation adjustment Revaluation reserve Net actuarial gains/(losses) on pension plans Net changes in capitalization of non-controlling interests Balance as of December 31, ,843 1 The number of common shares issued as of December 31, 2014 was 149,636,836 (December 31, 2013: 148,903,222, December 31, 2012: 148,300,123). 2 As approved by the Annual General Meeting on April 4, 2013, the dividend of CHF 17 per share was paid out of the capital contribution reserve. 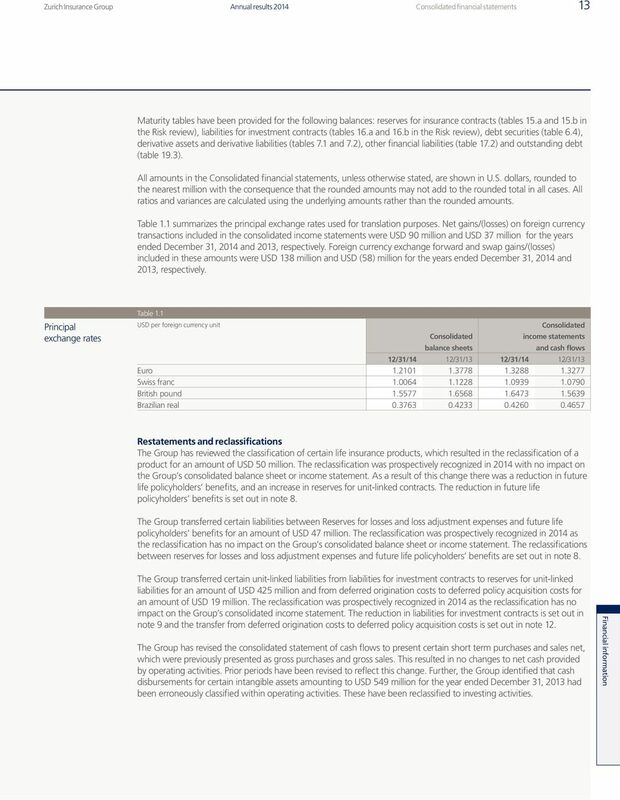 The difference of USD 718 million between the dividend at transaction day exchange rates amounting to USD 2,651 million and the dividend at historical exchange rates amounting to USD 1,933 million is reflected in the cumulative foreign currency translation adjustment. 3 As approved by the Annual General Meeting on April 2, 2014, the dividend of CHF 17 per share was paid out of the capital contribution reserve. The difference of USD 1,022 million between the dividend at transaction day exchange rates amounting to USD 2,837 million and the dividend at historical exchange rates amounting to USD 1,815 million is reflected in the cumulative foreign currency translation adjustment. 4 The number of treasury shares deducted from equity as of December 31, 2014 amounted to 1,292,220 (December 31, 2013: 1,320,652, December 31, 2012: 1,348,395). The notes to the Consolidated financial statements are an integral part of these Consolidated financial statements. 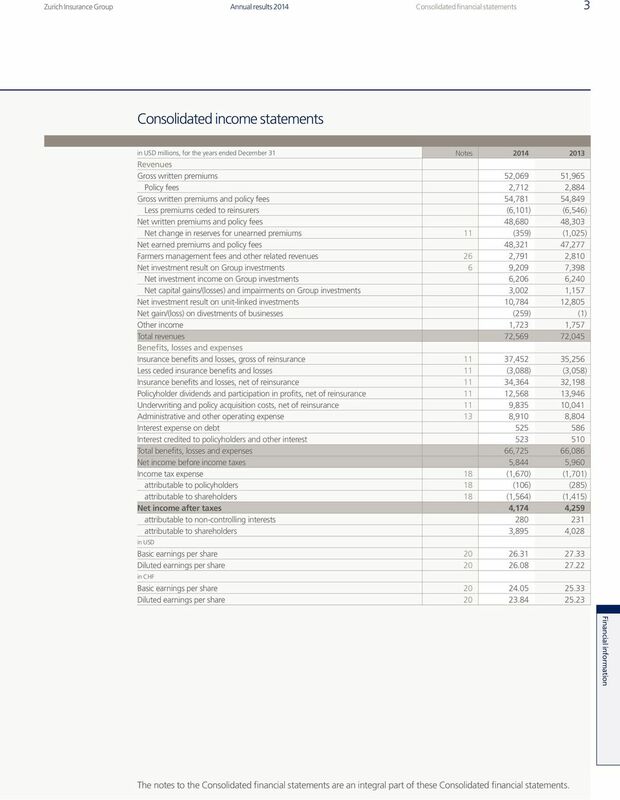 12 12 Annual results 2014 Consolidated financial statements continued Ltd and its subsidiaries (collectively the Group) is a provider of insurance products and related services. The Group mainly operates in Europe, North America, Latin America and Asia Pacific through subsidiaries, as well as branch and representative offices. Ltd, a Swiss corporation, is the holding company of the Group and is listed on the SIX Swiss Exchange. Ltd was incorporated on April 26, 2000, in Zurich, Switzerland. It is recorded in the Commercial Register of the Canton of Zurich under its registered address at Mythenquai 2, 8002 Zurich. On February 11, 2015 the Board of Directors of Ltd authorized these Consolidated financial statements for issue. These financial statements will be submitted for approval to the Annual General Meeting of Shareholders to be held on April 1, Basis of presentation General information The Consolidated financial statements of the Group have been prepared in accordance with International Financial Reporting Standards (IFRS) and comply with Swiss law. Where IFRS does not contain clear guidance governing the accounting treatment of certain transactions, including those that are specific to insurance and reinsurance products, IFRS permits reference to another comprehensive body of accounting principles that uses a similar conceptual framework. The Group s accounting policies for insurance and reinsurance contracts are therefore based on those developed by the Group before the adoption of IFRS 4 in areas where IFRS 4 did not include specific requirements. Before the time of adoption, the Group typically applied U.S. GAAP pronouncements issued by the Financial Accounting Standards Board (FASB) on insurance and reinsurance contracts. Any subsequent changes to such pronouncements are not reflected in the Group s accounting policies. In case of business combinations, the Group may decide to maintain the local statutory treatment if this does not distort the fair presentation of the financial position of the Group. If significant, the impact of such cases is described elsewhere in the notes to these Consolidated financial statements. 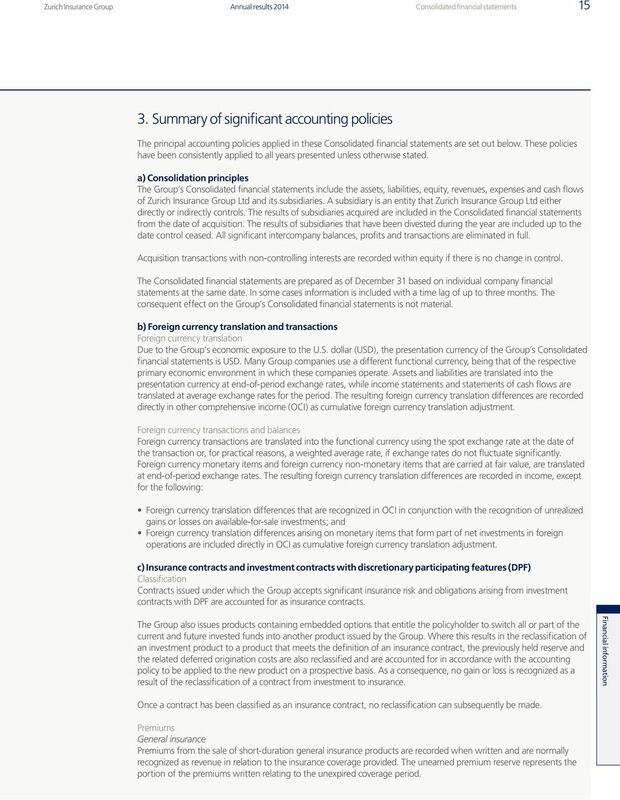 The accounting policies applied by the reportable segments are the same as those applied by the Group. The Group accounts for inter-segment revenues and transfers as if the transactions were with third parties at current market prices. Dividends, realized capital gains and losses as well as gains and losses on the transfer of net assets, are eliminated within the segment, whereas all other intercompany gains and losses are eliminated at Group level. 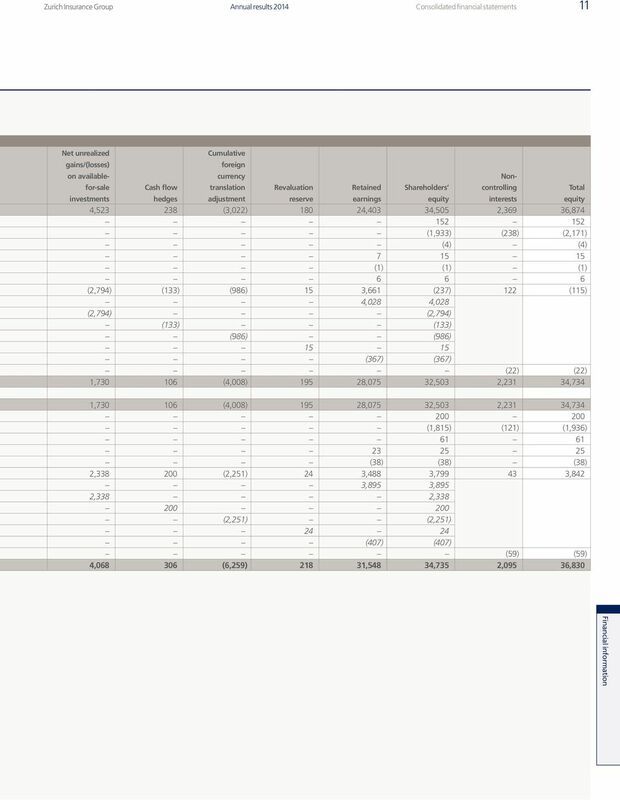 In the Consolidated financial statements, inter-segment revenues and transfers are eliminated. Disclosures under IFRS 4 Insurance Contracts and IFRS 7 Financial Instruments: Disclosures relating to the nature and extent of risks, and capital disclosures under IAS 1 Presentation of Financial Statements have been included in the audited sections of the Risk review on pages 115 to 152, and they form an integral part of the Consolidated financial statements. The Group s consolidated balance sheets are not presented using a current/non-current classification. 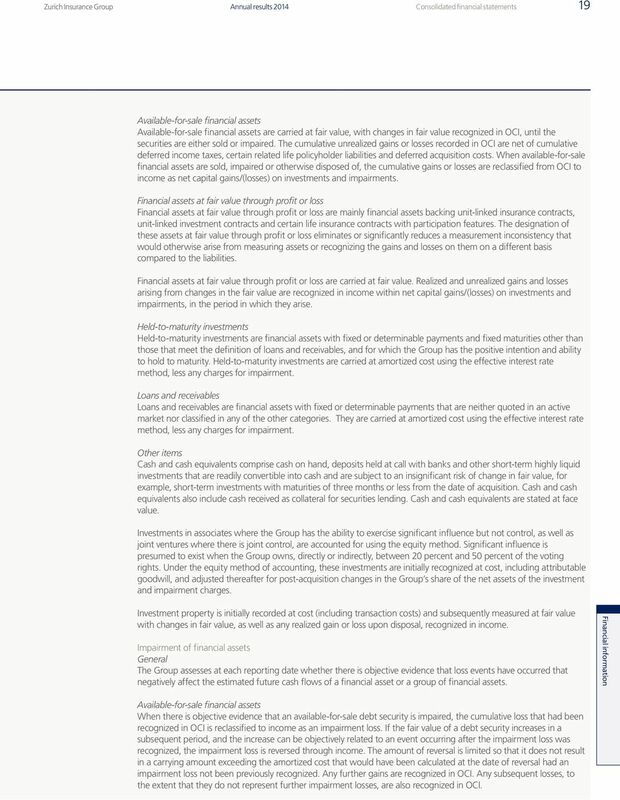 The following balances are generally considered to be current: cash and cash equivalents, deferred policy acquisition costs on general insurance contracts, accrued investment income, receivables, reserve for premium refunds, obligations to repurchase securities and accrued liabilities. The following balances are generally considered to be non-current: equity securities, investment property, investments in associates and joint ventures, deferred policy acquisition costs on life insurance contracts, deferred tax assets, property and equipment, goodwill, other intangible assets and deferred tax liabilities. The following balances are mixed in nature (including both current and non-current portions): debt securities, mortgage loans, other loans, reinsurers share of reserves for insurance contracts, deposits made under assumed reinsurance contracts, deferred origination costs, other assets, reserves and investments for unit-linked contracts, liabilities for investment contracts, deposits received under ceded reinsurance contracts, deferred front-end fees, reserves for losses and loss adjustment expenses, reserves for unearned premiums, future life policyholders benefits, policyholders contract deposits and other funds, other liabilities, senior and subordinated debt, and assets and liabilities held for sale. 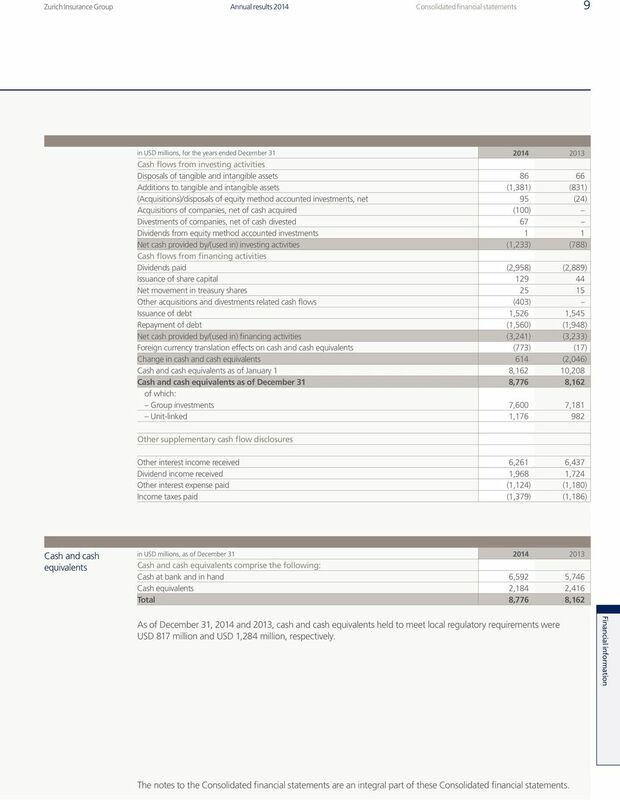 14 14 Annual results 2014 Consolidated financial statements continued 2. 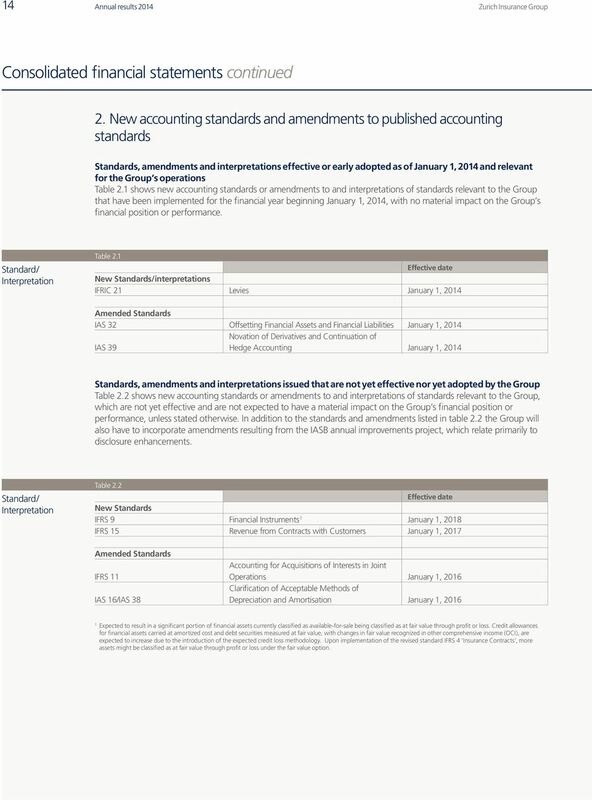 New accounting standards and amendments to published accounting standards Standards, amendments and interpretations effective or early adopted as of January 1, 2014 and relevant for the Group s operations Table 2.1 shows new accounting standards or amendments to and interpretations of standards relevant to the Group that have been implemented for the financial year beginning January 1, 2014, with no material impact on the Group s financial position or performance. Standard/ Interpretation Table 2.1 Effective date New Standards/interpretations IFRIC 21 Levies January 1, 2014 Amended Standards IAS 32 Offsetting Financial Assets and Financial Liabilities January 1, 2014 IAS 39 Novation of Derivatives and Continuation of Hedge Accounting January 1, 2014 Standards, amendments and interpretations issued that are not yet effective nor yet adopted by the Group Table 2.2 shows new accounting standards or amendments to and interpretations of standards relevant to the Group, which are not yet effective and are not expected to have a material impact on the Group s financial position or performance, unless stated otherwise. In addition to the standards and amendments listed in table 2.2 the Group will also have to incorporate amendments resulting from the IASB annual improvements project, which relate primarily to disclosure enhancements. Standard/ Interpretation Table 2.2 Effective date New Standards IFRS 9 Financial Instruments 1 January 1, 2018 IFRS 15 Revenue from Contracts with Customers January 1, 2017 Amended Standards IFRS 11 IAS 16/IAS 38 Accounting for Acquisitions of Interests in Joint Operations January 1, 2016 Clarification of Acceptable Methods of Depreciation and Amortisation January 1, Expected to result in a significant portion of financial assets currently classified as available-for-sale being classified as at fair value through profit or loss. Credit allowances for financial assets carried at amortized cost and debt securities measured at fair value, with changes in fair value recognized in other comprehensive income (OCI), are expected to increase due to the introduction of the expected credit loss methodology. Upon implementation of the revised standard IFRS 4 Insurance Contracts, more assets might be classified as at fair value through profit or loss under the fair value option. 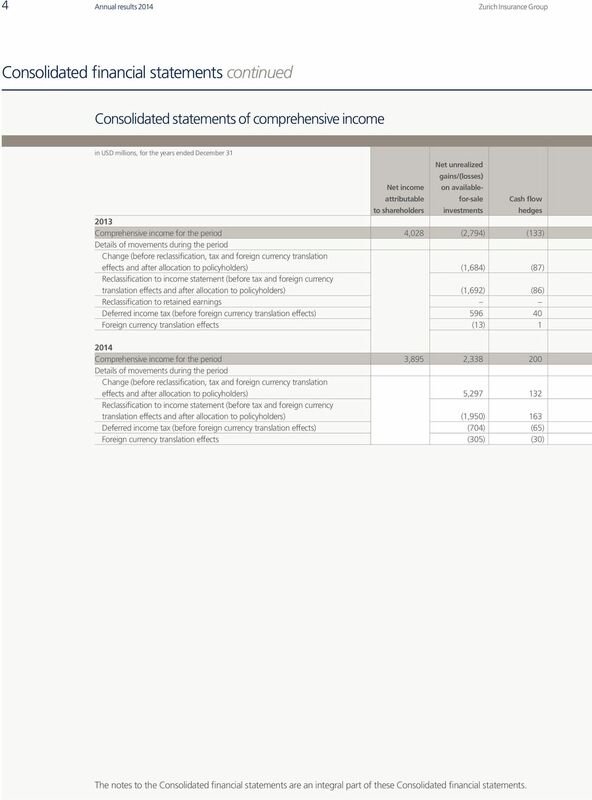 15 Annual results 2014 Consolidated financial statements Summary of significant accounting policies The principal accounting policies applied in these Consolidated financial statements are set out below. These policies have been consistently applied to all years presented unless otherwise stated. a) Consolidation principles The Group s Consolidated financial statements include the assets, liabilities, equity, revenues, expenses and cash flows of Ltd and its subsidiaries. A subsidiary is an entity that Ltd either directly or indirectly controls. The results of subsidiaries acquired are included in the Consolidated financial statements from the date of acquisition. The results of subsidiaries that have been divested during the year are included up to the date control ceased. All significant intercompany balances, profits and transactions are eliminated in full. Acquisition transactions with non-controlling interests are recorded within equity if there is no change in control. The Consolidated financial statements are prepared as of December 31 based on individual company financial statements at the same date. In some cases information is included with a time lag of up to three months. The consequent effect on the Group s Consolidated financial statements is not material. b) Foreign currency translation and transactions Foreign currency translation Due to the Group s economic exposure to the U.S. dollar (USD), the presentation currency of the Group s Consolidated financial statements is USD. Many Group companies use a different functional currency, being that of the respective primary economic environment in which these companies operate. Assets and liabilities are translated into the presentation currency at end-of-period exchange rates, while income statements and statements of cash flows are translated at average exchange rates for the period. The resulting foreign currency translation differences are recorded directly in other comprehensive income (OCI) as cumulative foreign currency translation adjustment. Foreign currency transactions and balances Foreign currency transactions are translated into the functional currency using the spot exchange rate at the date of the transaction or, for practical reasons, a weighted average rate, if exchange rates do not fluctuate significantly. Foreign currency monetary items and foreign currency non-monetary items that are carried at fair value, are translated at end-of-period exchange rates. The resulting foreign currency translation differences are recorded in income, except for the following: Foreign currency translation differences that are recognized in OCI in conjunction with the recognition of unrealized gains or losses on available-for-sale investments; and Foreign currency translation differences arising on monetary items that form part of net investments in foreign operations are included directly in OCI as cumulative foreign currency translation adjustment. c) Insurance contracts and investment contracts with discretionary participating features (DPF) Classification Contracts issued under which the Group accepts significant insurance risk and obligations arising from investment contracts with DPF are accounted for as insurance contracts. The Group also issues products containing embedded options that entitle the policyholder to switch all or part of the current and future invested funds into another product issued by the Group. 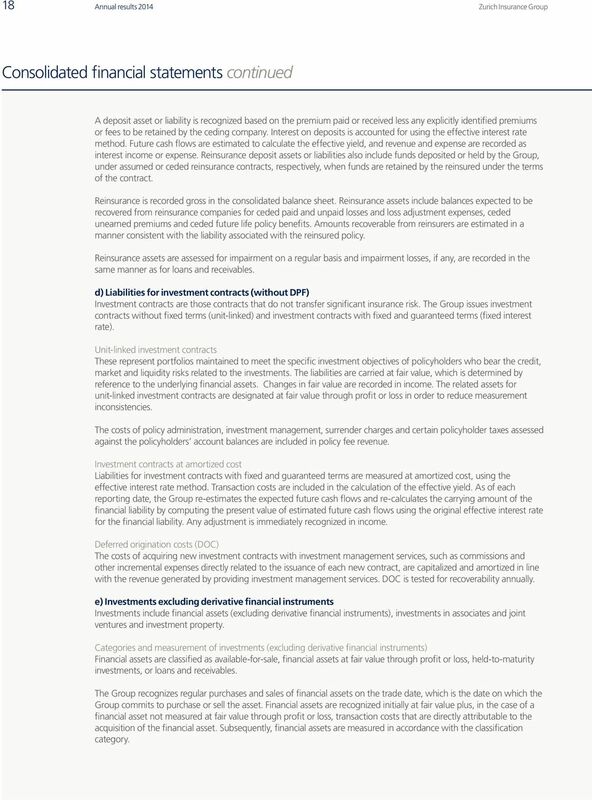 Where this results in the reclassification of an investment product to a product that meets the definition of an insurance contract, the previously held reserve and the related deferred origination costs are also reclassified and are accounted for in accordance with the accounting policy to be applied to the new product on a prospective basis. As a consequence, no gain or loss is recognized as a result of the reclassification of a contract from investment to insurance. Financial information Once a contract has been classified as an insurance contract, no reclassification can subsequently be made. Premiums General insurance Premiums from the sale of short-duration general insurance products are recorded when written and are normally recognized as revenue in relation to the insurance coverage provided. The unearned premium reserve represents the portion of the premiums written relating to the unexpired coverage period. 16 16 Annual results 2014 Consolidated financial statements continued Life insurance Premiums from traditional life insurance contracts, including participating contracts and annuity policies with life contingencies, are recognized as revenue when due from the policyholder. For single premium and limited pay contracts, premiums are recognized as revenue when due, with any excess profit deferred and recognized in income in a constant relationship to the insurance in-force or, for annuities, the amount of expected benefit payments. 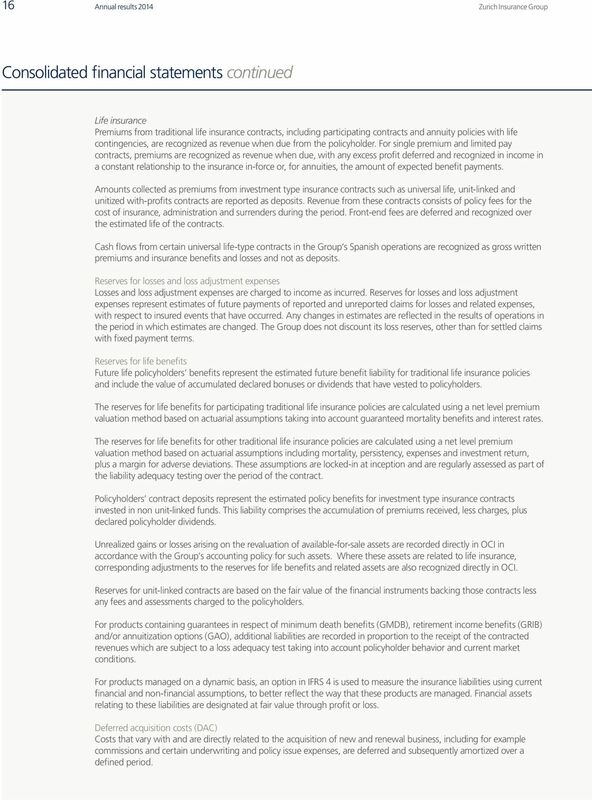 Amounts collected as premiums from investment type insurance contracts such as universal life, unit-linked and unitized with-profits contracts are reported as deposits. Revenue from these contracts consists of policy fees for the cost of insurance, administration and surrenders during the period. Front-end fees are deferred and recognized over the estimated life of the contracts. Cash flows from certain universal life-type contracts in the Group s Spanish operations are recognized as gross written premiums and insurance benefits and losses and not as deposits. Reserves for losses and loss adjustment expenses Losses and loss adjustment expenses are charged to income as incurred. Reserves for losses and loss adjustment expenses represent estimates of future payments of reported and unreported claims for losses and related expenses, with respect to insured events that have occurred. Any changes in estimates are reflected in the results of operations in the period in which estimates are changed. The Group does not discount its loss reserves, other than for settled claims with fixed payment terms. Reserves for life benefits Future life policyholders benefits represent the estimated future benefit liability for traditional life insurance policies and include the value of accumulated declared bonuses or dividends that have vested to policyholders. The reserves for life benefits for participating traditional life insurance policies are calculated using a net level premium valuation method based on actuarial assumptions taking into account guaranteed mortality benefits and interest rates. The reserves for life benefits for other traditional life insurance policies are calculated using a net level premium valuation method based on actuarial assumptions including mortality, persistency, expenses and investment return, plus a margin for adverse deviations. These assumptions are locked-in at inception and are regularly assessed as part of the liability adequacy testing over the period of the contract. Policyholders contract deposits represent the estimated policy benefits for investment type insurance contracts invested in non unit-linked funds. This liability comprises the accumulation of premiums received, less charges, plus declared policyholder dividends. Unrealized gains or losses arising on the revaluation of available-for-sale assets are recorded directly in OCI in accordance with the Group s accounting policy for such assets. Where these assets are related to life insurance, corresponding adjustments to the reserves for life benefits and related assets are also recognized directly in OCI. Reserves for unit-linked contracts are based on the fair value of the financial instruments backing those contracts less any fees and assessments charged to the policyholders. For products containing guarantees in respect of minimum death benefits (GMDB), retirement income benefits (GRIB) and/or annuitization options (GAO), additional liabilities are recorded in proportion to the receipt of the contracted revenues which are subject to a loss adequacy test taking into account policyholder behavior and current market conditions. For products managed on a dynamic basis, an option in IFRS 4 is used to measure the insurance liabilities using current financial and non-financial assumptions, to better reflect the way that these products are managed. Financial assets relating to these liabilities are designated at fair value through profit or loss. Deferred acquisition costs (DAC) Costs that vary with and are directly related to the acquisition of new and renewal business, including for example commissions and certain underwriting and policy issue expenses, are deferred and subsequently amortized over a defined period. 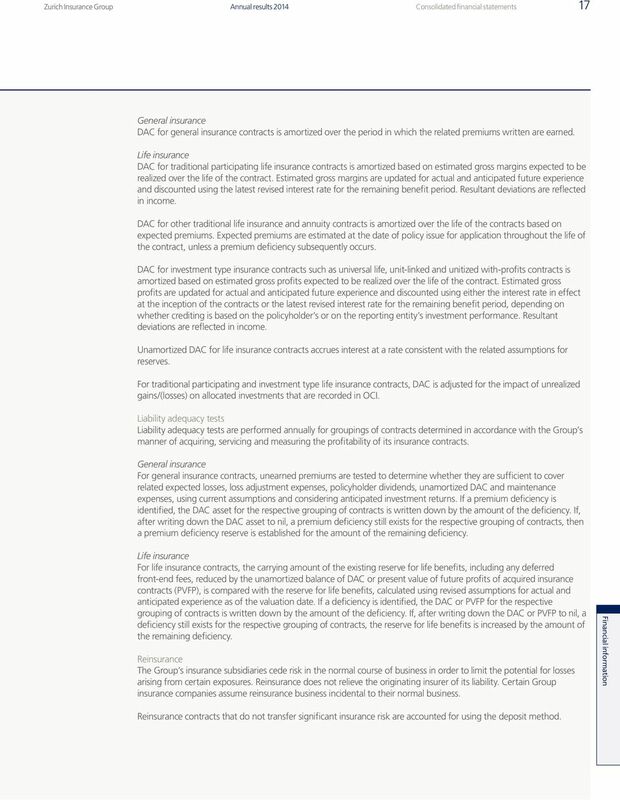 17 Annual results 2014 Consolidated financial statements 17 General insurance DAC for general insurance contracts is amortized over the period in which the related premiums written are earned. Life insurance DAC for traditional participating life insurance contracts is amortized based on estimated gross margins expected to be realized over the life of the contract. Estimated gross margins are updated for actual and anticipated future experience and discounted using the latest revised interest rate for the remaining benefit period. Resultant deviations are reflected in income. DAC for other traditional life insurance and annuity contracts is amortized over the life of the contracts based on expected premiums. Expected premiums are estimated at the date of policy issue for application throughout the life of the contract, unless a premium deficiency subsequently occurs. DAC for investment type insurance contracts such as universal life, unit-linked and unitized with-profits contracts is amortized based on estimated gross profits expected to be realized over the life of the contract. 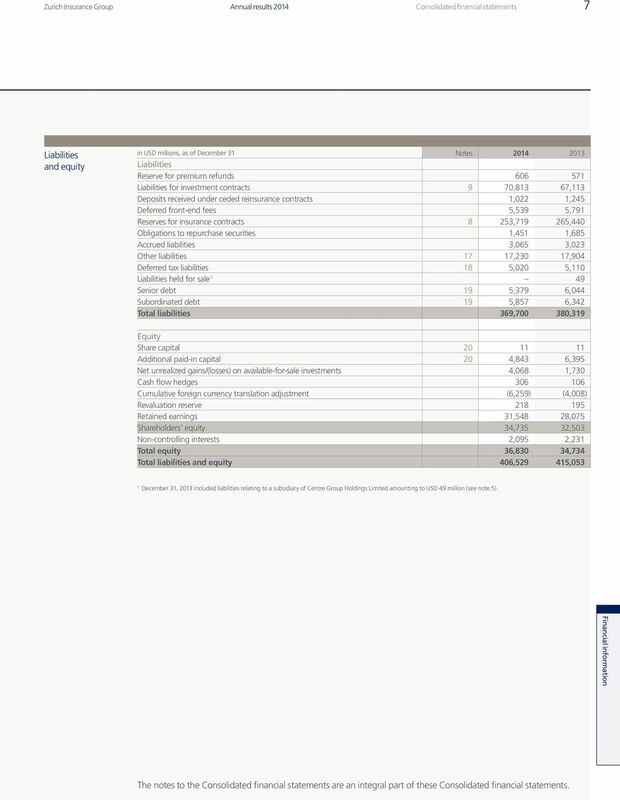 Estimated gross profits are updated for actual and anticipated future experience and discounted using either the interest rate in effect at the inception of the contracts or the latest revised interest rate for the remaining benefit period, depending on whether crediting is based on the policyholder s or on the reporting entity s investment performance. Resultant deviations are reflected in income. Unamortized DAC for life insurance contracts accrues interest at a rate consistent with the related assumptions for reserves. For traditional participating and investment type life insurance contracts, DAC is adjusted for the impact of unrealized gains/(losses) on allocated investments that are recorded in OCI. Liability adequacy tests Liability adequacy tests are performed annually for groupings of contracts determined in accordance with the Group s manner of acquiring, servicing and measuring the profitability of its insurance contracts. General insurance For general insurance contracts, unearned premiums are tested to determine whether they are sufficient to cover related expected losses, loss adjustment expenses, policyholder dividends, unamortized DAC and maintenance expenses, using current assumptions and considering anticipated investment returns. If a premium deficiency is identified, the DAC asset for the respective grouping of contracts is written down by the amount of the deficiency. If, after writing down the DAC asset to nil, a premium deficiency still exists for the respective grouping of contracts, then a premium deficiency reserve is established for the amount of the remaining deficiency. Life insurance For life insurance contracts, the carrying amount of the existing reserve for life benefits, including any deferred front-end fees, reduced by the unamortized balance of DAC or present value of future profits of acquired insurance contracts (PVFP), is compared with the reserve for life benefits, calculated using revised assumptions for actual and anticipated experience as of the valuation date. If a deficiency is identified, the DAC or PVFP for the respective grouping of contracts is written down by the amount of the deficiency. If, after writing down the DAC or PVFP to nil, a deficiency still exists for the respective grouping of contracts, the reserve for life benefits is increased by the amount of the remaining deficiency. Reinsurance The Group s insurance subsidiaries cede risk in the normal course of business in order to limit the potential for losses arising from certain exposures. Reinsurance does not relieve the originating insurer of its liability. Certain Group insurance companies assume reinsurance business incidental to their normal business. Financial information Reinsurance contracts that do not transfer significant insurance risk are accounted for using the deposit method. 18 18 Annual results 2014 Consolidated financial statements continued A deposit asset or liability is recognized based on the premium paid or received less any explicitly identified premiums or fees to be retained by the ceding company. Interest on deposits is accounted for using the effective interest rate method. Future cash flows are estimated to calculate the effective yield, and revenue and expense are recorded as interest income or expense. Reinsurance deposit assets or liabilities also include funds deposited or held by the Group, under assumed or ceded reinsurance contracts, respectively, when funds are retained by the reinsured under the terms of the contract. Reinsurance is recorded gross in the consolidated balance sheet. Reinsurance assets include balances expected to be recovered from reinsurance companies for ceded paid and unpaid losses and loss adjustment expenses, ceded unearned premiums and ceded future life policy benefits. Amounts recoverable from reinsurers are estimated in a manner consistent with the liability associated with the reinsured policy. Reinsurance assets are assessed for impairment on a regular basis and impairment losses, if any, are recorded in the same manner as for loans and receivables. d) Liabilities for investment contracts (without DPF) Investment contracts are those contracts that do not transfer significant insurance risk. The Group issues investment contracts without fixed terms (unit-linked) and investment contracts with fixed and guaranteed terms (fixed interest rate). Unit-linked investment contracts These represent portfolios maintained to meet the specific investment objectives of policyholders who bear the credit, market and liquidity risks related to the investments. The liabilities are carried at fair value, which is determined by reference to the underlying financial assets. Changes in fair value are recorded in income. The related assets for unit-linked investment contracts are designated at fair value through profit or loss in order to reduce measurement inconsistencies. The costs of policy administration, investment management, surrender charges and certain policyholder taxes assessed against the policyholders account balances are included in policy fee revenue. Investment contracts at amortized cost Liabilities for investment contracts with fixed and guaranteed terms are measured at amortized cost, using the effective interest rate method. Transaction costs are included in the calculation of the effective yield. 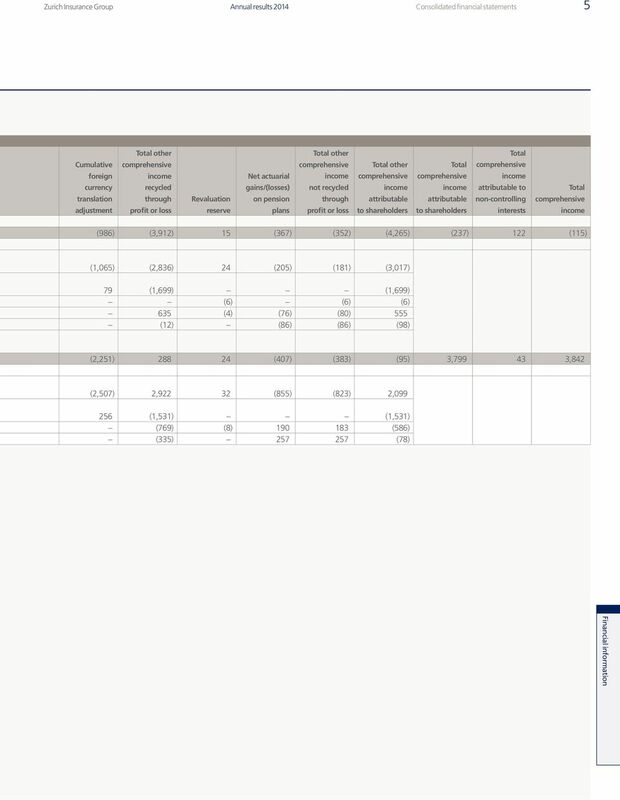 As of each reporting date, the Group re-estimates the expected future cash flows and re-calculates the carrying amount of the financial liability by computing the present value of estimated future cash flows using the original effective interest rate for the financial liability. Any adjustment is immediately recognized in income. Deferred origination costs (DOC) The costs of acquiring new investment contracts with investment management services, such as commissions and other incremental expenses directly related to the issuance of each new contract, are capitalized and amortized in line with the revenue generated by providing investment management services. DOC is tested for recoverability annually. e) Investments excluding derivative financial instruments Investments include financial assets (excluding derivative financial instruments), investments in associates and joint ventures and investment property. Categories and measurement of investments (excluding derivative financial instruments) Financial assets are classified as available-for-sale, financial assets at fair value through profit or loss, held-to-maturity investments, or loans and receivables. The Group recognizes regular purchases and sales of financial assets on the trade date, which is the date on which the Group commits to purchase or sell the asset. Financial assets are recognized initially at fair value plus, in the case of a financial asset not measured at fair value through profit or loss, transaction costs that are directly attributable to the acquisition of the financial asset. Subsequently, financial assets are measured in accordance with the classification category. 19 Annual results 2014 Consolidated financial statements 19 Available-for-sale financial assets Available-for-sale financial assets are carried at fair value, with changes in fair value recognized in OCI, until the securities are either sold or impaired. The cumulative unrealized gains or losses recorded in OCI are net of cumulative deferred income taxes, certain related life policyholder liabilities and deferred acquisition costs. When available-for-sale financial assets are sold, impaired or otherwise disposed of, the cumulative gains or losses are reclassified from OCI to income as net capital gains/(losses) on investments and impairments. Financial assets at fair value through profit or loss Financial assets at fair value through profit or loss are mainly financial assets backing unit-linked insurance contracts, unit-linked investment contracts and certain life insurance contracts with participation features. The designation of these assets at fair value through profit or loss eliminates or significantly reduces a measurement inconsistency that would otherwise arise from measuring assets or recognizing the gains and losses on them on a different basis compared to the liabilities. Financial assets at fair value through profit or loss are carried at fair value. Realized and unrealized gains and losses arising from changes in the fair value are recognized in income within net capital gains/(losses) on investments and impairments, in the period in which they arise. Held-to-maturity investments Held-to-maturity investments are financial assets with fixed or determinable payments and fixed maturities other than those that meet the definition of loans and receivables, and for which the Group has the positive intention and ability to hold to maturity. Held-to-maturity investments are carried at amortized cost using the effective interest rate method, less any charges for impairment. Loans and receivables Loans and receivables are financial assets with fixed or determinable payments that are neither quoted in an active market nor classified in any of the other categories. They are carried at amortized cost using the effective interest rate method, less any charges for impairment. Other items Cash and cash equivalents comprise cash on hand, deposits held at call with banks and other short-term highly liquid investments that are readily convertible into cash and are subject to an insignificant risk of change in fair value, for example, short-term investments with maturities of three months or less from the date of acquisition. Cash and cash equivalents also include cash received as collateral for securities lending. Cash and cash equivalents are stated at face value. Investments in associates where the Group has the ability to exercise significant influence but not control, as well as joint ventures where there is joint control, are accounted for using the equity method. Significant influence is presumed to exist when the Group owns, directly or indirectly, between 20 percent and 50 percent of the voting rights. Under the equity method of accounting, these investments are initially recognized at cost, including attributable goodwill, and adjusted thereafter for post-acquisition changes in the Group s share of the net assets of the investment and impairment charges. Investment property is initially recorded at cost (including transaction costs) and subsequently measured at fair value with changes in fair value, as well as any realized gain or loss upon disposal, recognized in income. Impairment of financial assets General The Group assesses at each reporting date whether there is objective evidence that loss events have occurred that negatively affect the estimated future cash flows of a financial asset or a group of financial assets. Financial information Available-for-sale financial assets When there is objective evidence that an available-for-sale debt security is impaired, the cumulative loss that had been recognized in OCI is reclassified to income as an impairment loss. If the fair value of a debt security increases in a subsequent period, and the increase can be objectively related to an event occurring after the impairment loss was recognized, the impairment loss is reversed through income. The amount of reversal is limited so that it does not result in a carrying amount exceeding the amortized cost that would have been calculated at the date of reversal had an impairment loss not been previously recognized. Any further gains are recognized in OCI. Any subsequent losses, to the extent that they do not represent further impairment losses, are also recognized in OCI. 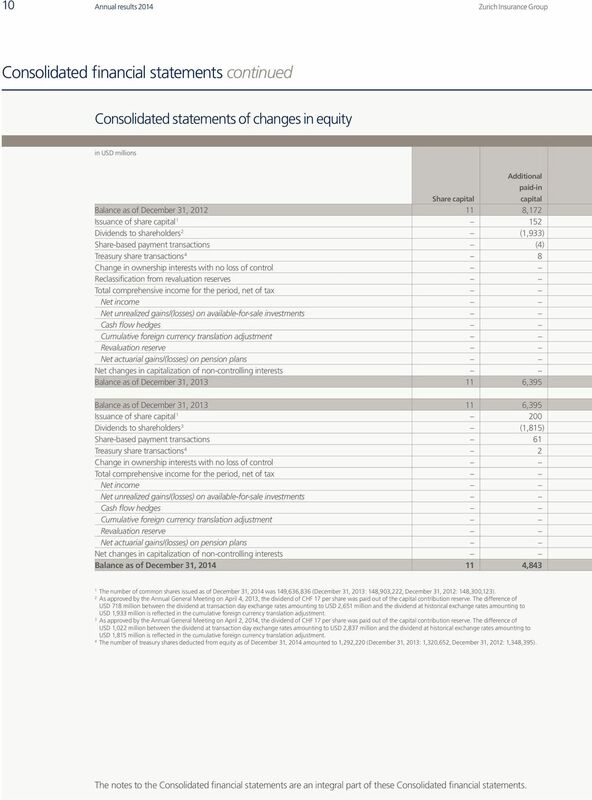 20 20 Annual results 2014 Consolidated financial statements continued When there is objective evidence that an available-for-sale equity security is impaired, the cumulative loss that had been recognized in OCI, including any portion attributable to foreign currency changes, is reclassified to income as an impairment loss. The impairment loss is the difference between the weighted-average acquisition cost (less any impairment loss on that security previously recognized in income) and the current fair value. Impairment losses on equity securities are not reversed through income, instead, when the fair value of a previously impaired equity security increases, the resulting unrealized gains are recognized in OCI. Any further decrease in fair value subsequent to recognition of an impairment loss is also recognized in income as an impairment loss, together with any portion attributable to foreign currency changes, until the equity security is derecognized. Held-to-maturity investments and loans and receivables Generally, significant financial assets are individually assessed to determine whether objective evidence of impairment exists. If no objective evidence of impairment exists, the asset is included in a group of financial assets with similar credit risk characteristics that are collectively assessed for impairment. Objective evidence of impairment exists if it is probable that the Group will not be able to collect principal and/or interest due according to the contractual terms of the instrument. When impairment is determined to have occurred, the carrying amount of held-to-maturity investments and loans and receivables is reduced through the use of an allowance account, and the movement in the impairment allowance is recognized in income as an impairment loss. 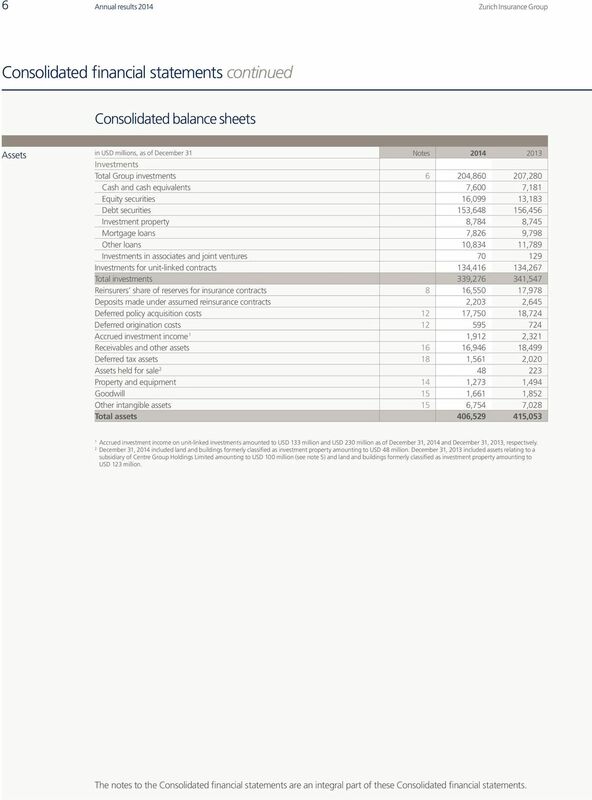 The impairment allowance is measured as the difference between the carrying amount of the assets and the present value of estimated future cash flows, calculated using the original effective interest rate, for fixed rate financial assets, or current effective interest rate, for variable rate financial assets. If the amount of the impairment loss decreases and the decrease relates objectively to an event occurring after the impairment loss was recognized, the impairment loss is reversed through income. The amount of reversal is limited so that it does not result in a carrying amount exceeding the amortized cost that would have been calculated at the date of reversal had an impairment loss not been previously recognized. f) Derivative financial instruments and hedge accounting Derivative financial instruments, except those designated under a qualifying hedge relationship, are classified as held for trading assets or liabilities and carried at fair value on the balance sheet with changes in fair value recognized in income. Derivative financial instruments that qualify for hedge accounting Derivative financial instruments are used by the Group to economically hedge risks. In limited circumstances derivative financial instruments are designated as hedging instruments for accounting purposes in: Fair value hedges which are hedges of the exposure to changes in the fair value of a recognized asset or liability; Cash flow hedges, which are hedges of the exposure to variability in cash flows attributable to a particular risk as associated with a recognized asset or liability or a highly probable forecast transaction and could affect profit or loss; or Net investment hedges, which are hedges of a net investment in a foreign operation. All hedge relationships are formally documented, including the risk management objectives and strategy for undertaking the hedge. 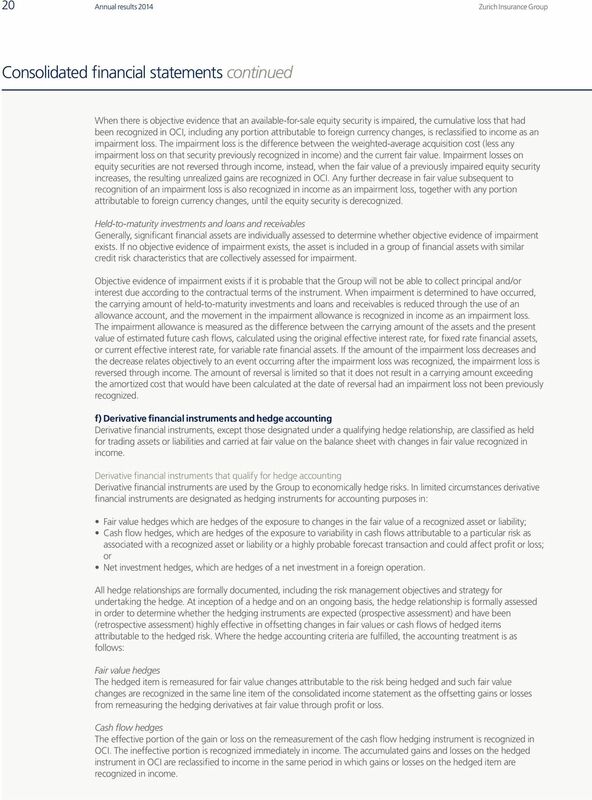 At inception of a hedge and on an ongoing basis, the hedge relationship is formally assessed in order to determine whether the hedging instruments are expected (prospective assessment) and have been (retrospective assessment) highly effective in offsetting changes in fair values or cash flows of hedged items attributable to the hedged risk. Where the hedge accounting criteria are fulfilled, the accounting treatment is as follows: Fair value hedges The hedged item is remeasured for fair value changes attributable to the risk being hedged and such fair value changes are recognized in the same line item of the consolidated income statement as the offsetting gains or losses from remeasuring the hedging derivatives at fair value through profit or loss. Cash flow hedges The effective portion of the gain or loss on the remeasurement of the cash flow hedging instrument is recognized in OCI. The ineffective portion is recognized immediately in income. The accumulated gains and losses on the hedged instrument in OCI are reclassified to income in the same period in which gains or losses on the hedged item are recognized in income.